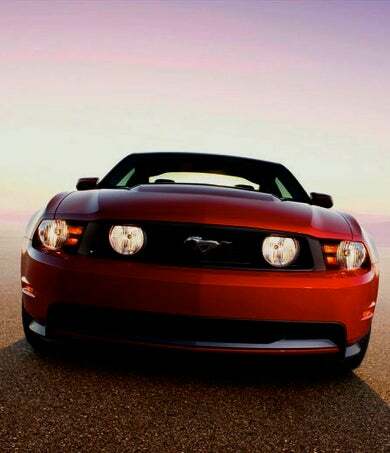 The 2011 Ford Mustang V6 will get a Camaro-beating 315 HP V6, according to leaked info posted on The Mustang Source. The new "Coyote" V8, however, will only make 400 HP, slightly behind the Camaro SS. More below. This information is in line with what we've been hearing from our sources at Ford all year. The 2010 Ford Mustang GT came second in our Muscle Car Comparison Test chiefly due to the horsepower deficit between it and the 2010 Chevy Camaro SS (As well as a lack of panache. Wes keeps forgetting this. Kids. — Ed. ), an additional 85 HP will go a long way towards making that up. When we tested a Track Pack-equipped 2010 Mustang GT late last year we were enormously impressed by its handling and composure, with our only real concern being over the somewhat weak and wooden brakes. The Brembos would be a welcome addition. It should be noted that the lap time comparison allegedly took place between a Mustang wearing R-compound rubber and an M3 on street tires.